Though the last few days' temperatures have been no guide, summer is approaching and the garden shows it. 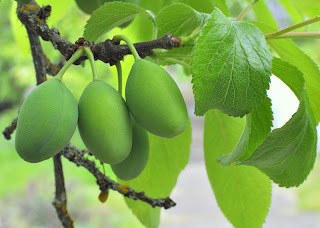 Plums and cherries are gaining bulk and, with luck, some sweetness and color in the next weeks. There are a few red strawberries nestled among the hard green ones. We are wishing we had several yard bins to cope with the massive influx of dandelions, sticky willy, knotweed and all those other reminders about the truth of "that which doesn't kill you makes you stronger". I'm also paying for my sins of planting vinca, forget-me-nots, shasta daisys and tall verbena-- these a reminder that sometimes a little is still too much and best enjoyed in someone else's biome. Gardening is a form of spring cleaning. It's not until we can clear out the old debris that we can truly appreciate what we have and see more clearly our intentions. I've been taking the metaphor to the extreme by allowing the detrius of the past years to gather in ever higher and more intimidating piles. "Just Do It" plays a drumbeat in my brain, drowned out by "...later". There are so many juicy distractions in the world, all with more compelling siren calls than cleaning the closet. But I hear the call of a clearer day, and I hope to answer it. Like many professional procrastinators, I have all sorts of tricks of my sleeve to avoid tasks that are complex, or more problematic to me, just boring. I need a certain amount of anxious juice to plow through the inertia and get her done. This week I'll be taking some of my own medicine to bust these habits, rather than waiting for the crisis of the moment to propel me.
! One Step in the Right Direction will be accomplished today by : ___________________________. That's it. I want to tackle a little of something Ominous/Annoying/Shaming each day. Tomorrow's goal is seemingly small-- I let my last dental check up slide by around the time my dad died, then never rescheduled. Scary Bully In My Head had lots to say about that-- dentist will be mad, hygienist will lecture, there will be Hell to Pay in one form or another. So I put off and off and off rescheduling. I'm calling tomorrow. 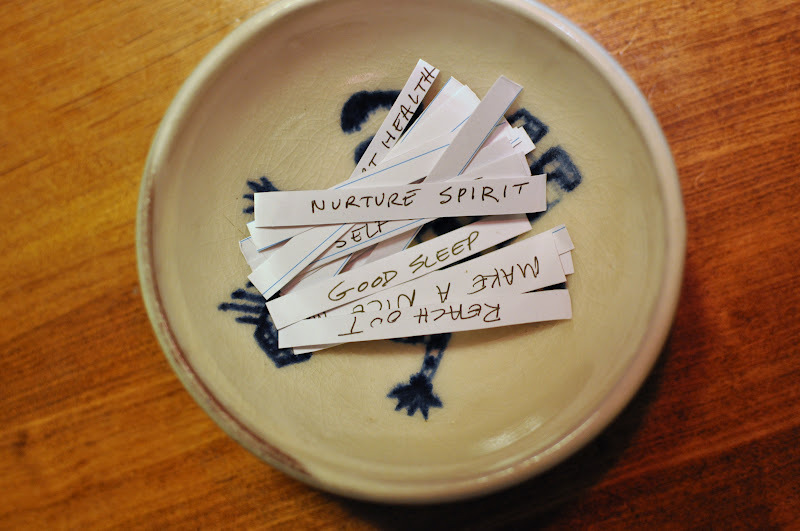 My other intervention this week is to create a little intentions bowl and fill it with slips of paper with words on it representing areas of my life that could use some attention-- not any of them necessarily pressing at a particular moment, but all pressing over time. Each day I'll pick a word out in the morning and think about how I might show intention in a small or big way toward that concept. Here are some of the words in my bowl and how I might use their encouragement (just examples). Relationships: Are their relationships in my life that need more breath or care? Write a letter, make a date, do a kindness. Health: If I choose this slip tomorrow, it may encourage me to talk a walk during lunch, or a date at the gym, or skip the junk foods offered that day. Career: Oh, the endless possibilities. I can work on learning the new billing system, set up new policies for no-shows, order that nifty device that allows me to take credit and debit cards. Responsibility: I can get that book back to the library. Empty the cat box before someone who can smell lets me know it needs it, Return that borrowed dress. Happiness: I can schedule or make flyers for the Scotch and Poetry night I've been wanting to host. I can call someone I love and tell them that. I can dance to a favorite tune in the kitchen, or just practice letting my crabby thoughts rise and sink instead of inviting them in for a pity party. The point isn't to create lots more To Do lists, but to be aware and look for opportunities to live the intentions you carry around everyday anyway. To make manifest! If you try these and don't mind sharing, I'd love to hear if it was helpful for you.